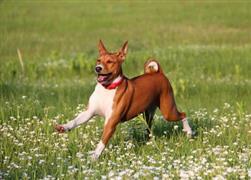 The Basenji is a hunting dog with rich origins in Africa. Many great names can be taken from the various languages in use throughout the continent. Start by picking a language (Swahili, Arabic, and Zulu are a few common ones) . Choose words that describe or fit your dog and search for a translation. Just reading through a list of words may also trigger ideas. If you don’t know the meaning of the word, be sure to investigate further to avoid naming your dog something bad or negative. The Basenji has many unique characteristics that can help owners to come up with a themed name. The breed, often referred to as ‘barkless dog’, is known for not making the barking sound that most other dogs make. Although the Basenji doesn’t bark, it can still make plenty of noise. Some name ideas derived from this distinctive trait include Yodel, Barroo, and Whisper. Some of our pages will contain a subcategory. A subcategory is a slightly more specific grouping than the main topic of the page. For a subcategory, we will include a separated table of names and corresponding descriptions. An example of a subcategory of Red Dog Names would be 'Dog Names Inspired by Red Wines'. If you have any subcategory ideas for the Basenji Names page, we would love to hear them. Use the form below to submit your ideas.